Our exposure meters respond only to the light falling on their photosensors. They compute the possible combinations of exposure time and f-stop that would have the same photographic effect if the film were a true integrator of light energy. We know that is not the case and use the term "reciprocity failure" to describe the actual behavior of film. We often think of this failure as suddenly coming on at a certain exposure level because the there is a range of exposure times in which its effects are not significant. If you are a view camera user, the chances are that you select the aperture to be used by consideration of depth of field and read the corresponding exposure time from a light meter's calculator dial. You are likely to find the indicated time is long enough to run into low intensity reciprocity failure, LIRF for short. Having to adjust exposure times for the effects of non-linear reciprocity can be an inhibiting factor. The cost of one sheet of 8X10" film, and the uncertainty of reciprocity relationships of unfamiliar films can lead to reluctance to use unfamiliar films. I will show you how to minimize the amount of film required for testing. The light energy striking the film is directly proportional to the product of illumination and time, I*t, at any given wavelength of light. If the film were a perfect integrator of energy, the time required to produce a given photolytic density would be inversely proportional to the illumination. Photolytic density is what makes up the developable image. I*t from experimental data is often plotted against illumination, I, at constant density to show that film has an optimum energy efficiency at some particular value of I. (See reference 1.) Each line of constant density in such a plot has the general appearance of a catenary, which is the curve formed by a slack rope hanging between two hooks. While there is no simple inverse relationship between I and t, the catenary shape shows that there is a minimum t at some value of I. This value of t will be that which we read from a light meter's exposure calculator. Call it tm . If we concern ourselves only with the LIRF part of this curve, the correct exposure time will be equal to or greater than the value we read from a light meter. where t is the exposure time corrected for LIRF and tc is the correction applied to the measured time. If tc is some function of tm, What kind of function should it be? At this point we can make use of an old engineering trick. We plot experimentally determined values of t - tm. 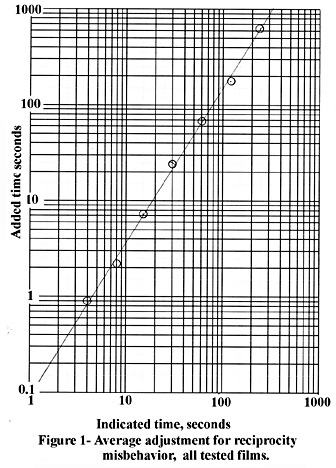 on each of three kinds of graph paper, linear, semi-log and full-log, against tm. One of these three graphs should give a clue as to the nature of the equation. The constant a is the value of tc where tm is 1 second. The constant b is the tangent of the angle the line makes with the tm axis. All of the mathematical operations involved in these equations are available in low priced pocket calculators such as the TI-30 IIS. The line of best fit in Figure 1 has a slope of 1.62, which is the tangent of 58.3 degrees. Figure 2 shows the lines for the individual films. In each case, I found the line of slope 1.62 that gave the minimum mean square error of fit. I forced the fit to the slope of the mean of all the data because each condition had few data points. The random experimental error was large enough that the confidence of individually estimated slopes was low and their spread was large. In this case, the mean square error of fit of each film when the slopes were free was not significantly different from the mean square error for the same film when the slope was constrained to be 1.62. 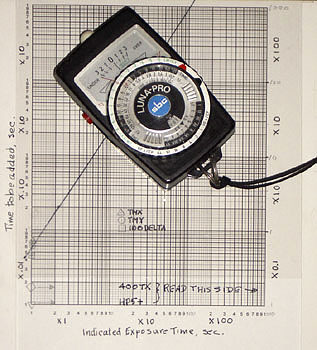 When you need to correct a long exposure, read the tm from your light meter at the f-stop you want to use. Read tc from the graph at tm and add it to tm to get the exposure time corrected for LIRF. You can put several lines for different films on the same graph as, shown in Figure 2. Since the lines for all the films tested have the same slope (within acceptable accuracy), a transparent overlay with a single line of the proper slope may be used for all these films. Now it is a simple matter to make guides along the edges of the graph and witness marks on the graph so that the overlay can be slid from one witness mark to another. If we dare accept as fact that LIRF for all films can be represented by a straight line on full-log paper, at most two corrected exposure times will be required to establish that line. If in addition, we accept that the slope of that line is the same for all films, we need only one corrected time to establish the line. a = 10/(10^1.62) = 0.24 seconds. 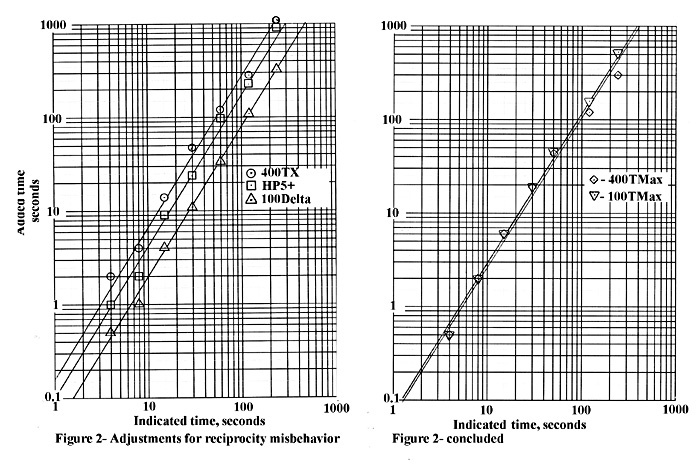 Experimental determination of reciprocity characteristics is a tedious process. Each trial involves measurements of exposure and development time, developer concentration and temperature, and measurements of density, each of which is subject to both random and systematic error. As a result, even though it is theoretically possible to derive all we need to know from two experiments, repetition of the same two nominal conditions will be likely to have such errors that the values of the coefficients a and b calculated from them will vary greatly from trial to trial. The question is, how great is great enough to cause a catastrophe in the field? In the field we have another set of possible errors that may or may not accumulate. How do we ever get a decent photograph? The greatest deviation I see of an experimental data point from the fitted curve is in the plot of 400TMax. At 250 seconds indicated exposure, the fitted line shows 460 seconds of correction, while the data point shows 300. The total corrected exposure would thus be estimated at 710 seconds by the fitted line and 550 seconds by the data. While this error seems large, it is only about 1/3 f-stop. Here is the slide rule calculator set for T-Max 400.